The expansive windows facing the ocean allow for dramatic views throughout the homes. Located on Point Cabrillo, in between the towns of Mendocino and Fort Bragg, LaDimora is centrally located for whatever adventures your Mendocino Coast vacation has in store. Its within walking distance of Point Cabrillo Lighthouse and Russian Gulch Park, providing near endless opportunities to hike and explore. And while La Dimora is set back from the ocean edge, you can walk to it - with a deeded ocean access - and sit on a bench by the ocean's edge. Enjoy the wildlife that frequent it's grounds; deer, turkeys, hawks, rabbits and more. It's a great vantage for whale watching during certain parts of the year. La Dimora was built with great care and attention to detail. Large decks are wonderful for ocean viewing, for cocktails - or a nap in the sun. There are Italian antique furnishings, there is a "flo-bed" with memory foam mattress in the master bedroom and a romantic Jacuzzi-type tub for two in the master bath with an ocean view. Why would you want to be someplace else? With 3 bedrooms, plus a den w/ 2 twin beds and 3.5 baths La Dimora is truly the place to be when you need to get away from it all. To see all photos and details visit our website. Very nice and relaxing with great views. Set up perfect for two families and Cindy was very nice and easy to work with as host. Flawless. The brochure pix are exactly what we found at the property. Beautiful inside and out. Deer came thru the yard every day. We also had 14 turkeys !!! show up and march thru the backyard and down the driveway a couple of times. We were a party of three women and one small dog and we each had a private bedroom and bathroom space. Even our own outside space off our bedrooms. This was truly a great experience start to finish. Thanks Mendocino Realty and VRBO. a guest from Lake Zurich, IL does not recommend this vacation rental. House has intent to be luxurious, but fails in the details. Lots of wasted space, with only actual TV in an upper floor man cave. Several items broke during stay. Access to ocean front in ad is hard to find. No working fireplace. That said, the area demands that you have a good time, and the kitchen was workable for those who like to eat in. From start to finish Mendocino Preferred was easy to work with and accommodating. House has a great setup for families or multiple couples with all that you need. Path to bluff bench is as follows: walk down road toward ocean. Turn left at address post. There are 2 posts with a chain. Turn left through field and look for 'beaten' path toward sea through bushes. Can't wait to return! The house was just as it was advertised. It was a beautiful house , large rooms and the kitchen was very well equipped. We loved all the bathrooms. We had 7 adults that needed to prepare for a wedding and had plenty of bathrooms to allow everyone prep time. The management company was very responsive to our needs. There was WiFi at the house but reception is weak. Overall, we were very pleased. A relaxing weekend at the coast. My family and I had a wonderful weekend at La Dimora. The home is just lovely and light. The kitchen has just about everything you could possibly need to cook and bake. We had big family meals every night at the dining room table and watched the sun set out of the large picture windows. I loved sitting on the deck and watching the waves while I had my morning coffee. There were also lots of turkeys and quail and other little visitors that came through the yard throughout the day which was really fun for the kids. The only real negative, as mentioned in other reviews, is that the steps in to the living area are a little dangerous. We had several people miss the step and fall, even though we knew about it ahead of time. There are light strings around the edges, but somehow it still caught us off guard quite a few times. Overall we had a wonderful stay and would happily return! Mendocino Preferred Vacation Rentals has been very helpful and accommodating. While our problems during an extended stay were few, we found the agency to be very responsive and helpful in resolving them. other side but more warning should be given as a person first walks is a dangerous first step. La Dimora provided a serene place to return after our activities of the day. The house was very conveniently located, close to Mendocino town but secluded enough to experience the tranquility of the northern California coastline. It is nicely furnished and has very nice open plan kitchen / living room, which is ideal for enjoying meals as a group. Perfect house for 3 couples. This home was beautiful. The views were fantastic. We were traveling with another family and the layout was ideal for this setup. We will be back. Great view from the deck. 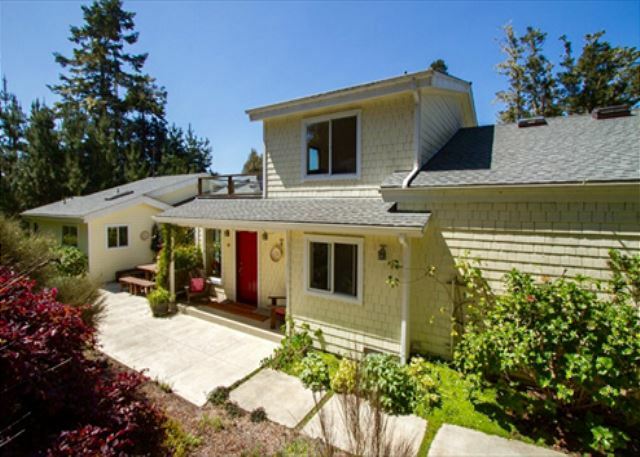 This is a very nice house located close to both Mendocino and Fort Bragg. It is also very spacious and allowed 3 couples each a bedroom and bathroom. It could use a little more cleaning. the floors were dusty and the windows needing some cleaning. Overall we were very happy with the house, we all had a great time. Thank you. a guest from Keller, TX does not recommend this vacation rental. This is not the first time we've been at La Dimora. The location is spectacular. But the dwelling has not been maintained. The exterior is showing considerable wear, along with the deck and its furniture. Thank you for the review, Edward. We're sorry you didn't find the property in acceptable condition. We pride ourselves in providing well-maintained and inviting homes and we're sorry that was not the case for your stay. We have sent you an email so we can get a better sense of exactly what was not up to snuff aside from the deck and furniture and want to assure you we will take immediate actions to implement your input. We hope to hear from you and thank you again for the feedback. We arrived after dark and the check in experience was flawless. We entered to an amazingly well laid out home, optimized for vacation rental guests. Waking up the next morning was magical, the ocean view is spectacular and we watched deer wander through the grounds as we drank coffee. Absolutely perfect getaway and very close to Mendocino town. I hope to return. My only request would be to have the checkout policy improved. We had to be out of the property by 11am, not unreasonable, but since we were responsible for cleaning dishes it felt like we had to rush breakfast. Allowing us to leave dishes in the dishwasher would have bought us a nice chunk of time and provided a more relaxing checkout experience. In a fierce winter rainstorm power-outage, the great generator at La Dimora supported the entire house without a flicker. Follow the moon and the stars through the skylight in the master bedroom. Watch hummingbirds search for winter blooms in the protected patio. Turn on Sirius XM Symphony Classics in the TV room and turn up the volume. Pour the wine. Every person in our group complemented on this vacation home. Great location, great views, and very spacious layout for every body. Will come back for sure! We had a lovely stay, enhanced by this lovely and spacious home, overlooking the sea. How soothing is the constant sound of the sea. We would recommend La Dimora to anyone who desires a real respite from rush and demand of ever day. 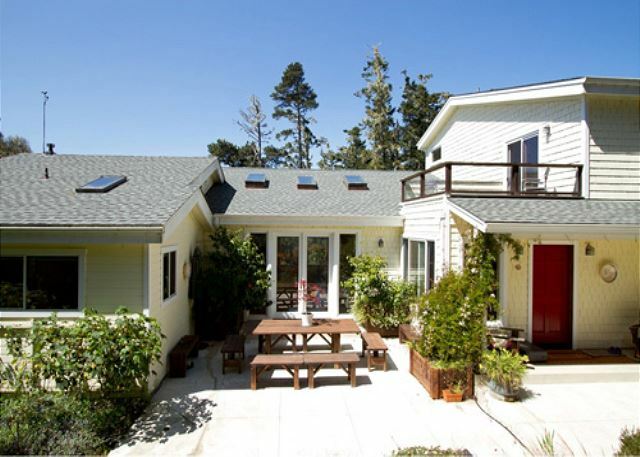 Beautiful house with even more beautiful views of the Mendo & Pacific. It was spacious, calm, clean, and very relaxing. Have ZERO complaints. Great stay all around. No hassles and easy to find and check in/check out. our family of 6 was together for a weekend of abalone diving. this was a perfect spot for us. comfortable, well equipped and very private but centrally located. loved that we could bring our dog too!! !only suggestion would be better shades in master bedroom- skylight and light curtains made it very light, very early. We loved the house. It's bigger and more lovely than expected. We had 8 people and there was plenty of room for everyone. The view from the deck was beautiful and we enjoyed morning coffee in the sun there. Huge Master bedroom Suite with soaking tub and view. All wonderful. We'll be back. Lovely home that is nicely maintained. It was clean and the manager was responsive to our needs. The only problem is a level change in the great room that you can't see. One of our guest tripped and fell down hard. We all had a grand time at La Dimora. The location, views and accommodations were fantastic. High recommended! Spacious, airy house with fantastic views from the bedrooms. Spacious, airy house with fantastic views from the bedrooms. Worked out great for our kids and their grandmother. Really liked the layout of the place, including a handy TV room upstairs. Great location close to Cabrillo lighthouse and state parks. A few things are getting a bit tired, e.g temperamental dishwasher, and there are quite a few knickknacks around the place which may not be to everyone's taste. Love LaDimora. This is our second stay and we'll be back. Situated between two state parks and just five minutes to Mendocino- but who wants to leave the view? Positive: The overall 3-night stay was good. The house is in a good location and there was plenty of room. The grounds are very pleasant and nice. The best thing about the house was you could see and hear the ocean. The kitchen was fairly well stocked, but we could have used a few more kitchen towels. The master bedroom suite was great. Negative: The house was dusty around the window sills and paintings and there was a tissue left on the master bedroom side table. We had 6 people but we were only given 1 key. The house is built with several levels (steps up and down) from kitchen to living room to bedroom areas with all the same type of light-colored, hardwood flooring which made it difficult to distinguish the different levels, and made for a lot of stubbed toes for everyone! One of the bathrooms has a claw tub/shower with a curtain that wrapped around you when taking a shower making it difficult to shower in a cocoon. It was a beautiful house on an amazing view of the pacific ocean. It was well equipped, clean and comfortable. We enjoyed the privacy and the spaciousness of the house. We are a family with twin girls, extended family, and a dog, and we always stay in Mendocino for our anniversary. Since the girls were born, we bring extended family as well so we can go to dinner and such. It has turned into a wonderful annual family vacation. La Dimora was the perfect setting, and the perfect house for this purpose. Everyone had their own space, and we didn't want for anything. The only thing that would have made it perfect would have been a hot tub! La Mi Mora - Fantabulous!!! Everything about this home is more than we expected. Usually pictures are not the real representation of the home. In this case the home was far more than the pictures could capture. Can't wait to rent it again for a longer period of time because 3 days was just not enough! Great view, super comfortable house, roomy, every kitchen gadget you can imagine....perfect location. Well-located detached single-family home in Caspar, just a mile or so north of Mendocino. Clean, well-maintained property. Large family room and kitchen area conducive to family get-togethers. Nice view of ocean, but not too close where crashing surf may be annoying at night. Well-stocked with kitchen supplies, glassware, silverware, etc. Deck area very large and pleasant. We had the most wonderful weekend away at La Dimora meeting up with family from Vancouver. The house was an absolute haven with plenty of spaces for teens to get away and large bedrooms for everyone. The kitchen dining area was just perfect for meals together and the views were outstanding. Just a few minutes drive to Mendocino. We didn't want to leave and in fact part of the family stayed on for a few more days.